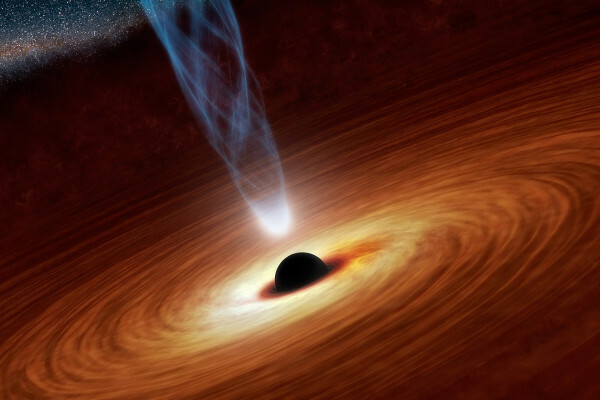 If light has no mass, how can a black hole capture it? Part of the show Why do we Stop Noticing Smells? Dave - Light has no mass but it is affected by the shape of space. What Einstein worked out in general relativity was if you have a very large mass it distorts the shape of space. If you shine light across a curved piece of space it will get bent by it. A black hole is basically so heavy that it bends space so much that light will get bent a bit like a lens and come straight back into the black hole again. Chris - That's why they look black, because there's no light coming back out. Previous How quickly can a person exsanguinate from a cut artery? Next What makes our hair turn grey? How does light change speed? Why does your stomach get left behind when an aeroplane drops?